New Parents are People Too won the iParenting Media Award. A Disney Website! Welcome to People Too Unlimited! 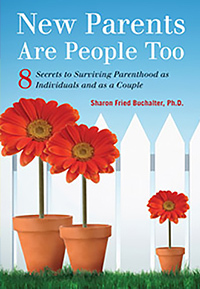 Distinguished best-selling author and renowned clinical psychologist, Dr. Sharon Fried Buchalter, and her company, People Too Unlimited invites you to unlock the secrets to a happier child…and a happier you! Distinguished best-selling author and renowned clinical psychologist, Dr. Sharon Fried Buchalter, and her company, People Too Unlimited invite you to unlock the secrets to a happier child…and a happier you! Dr. Sharon understands that parenting is the most important job a person will ever have, and that it is easy for first-time parents and even experienced parents to feel overwhelmed at times. In addition, because of parenting responsibilities, it is common for couples to neglect nurturing their own relationship. Too often in these situations, a loving couple’s own needs are no longer a priority. Dr. Sharon is dedicated to helping people discover their life purpose, achieve success, and have harmonious family relationships. Using practical common sense approaches, Dr. Sharon’s breakthrough techniques in parenting, relationship coaching, and self-help are helping families all over the world! Children are People Too: Unlocking the 8 Secrets to Family Happiness. 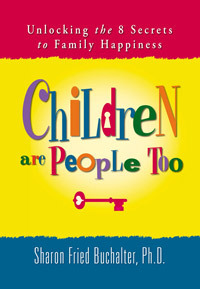 In Children Are People Too Dr. Sharon Fried Buchalter unlocks the secrets to a happier child and a happier you. Self-mentoring is a process that enables you to understand your goals; where you are and where you want to be. “I invite you to join the growing number of people who are part of an exclusive team. This team is helping to spread the word about raising happy and successful children, while at the same time being a happy and successful individual, parent, and couple. I believe that life is a tapestry to be woven. With family in the center of this beautiful work of art, it is my honor to guide you on your journey. My two books New Parents are People Too: 8 Secrets to Surviving Parenthood as Individuals and as a Couple and Children are People Too: Unlocking the 8 Secrets to Family Happiness are carefully designed to offer you simple, yet practical steps to true family harmony. A portion of all book sales is donated to benefit children’s charities. It is my goal to educate, enlighten, and empower children and their parents, so that all children’s voices can finally be heard!